The food-packaging sector is continuously evolving. The new packaging trends demand sustainable, environmentally-friendly packaging and the compliance with strict hygiene standards. For global packaging and paper producers like Mondi Group, this means producing paper with optimum technical quality, which in turn entails constant renewal of the machinery. To meet these market demands, Mondi requested Pasaban to jointly develop a series of top quality customised machines. Mondi is global leader in packaging and paper, employing around 26,000 people in over 30 countries. The company is fully integrated across the packaging and paper value chain - from managing forests and producing pulp, paper and plastic films, to developing and manufacturing effective industrial and consumer packaging solutions. Their paper mill in Ulmerfeld-Hausmening (Austria) produces uncoated fine paper, a variety of specialty papers and paper for professional printing including some for food sensitive applications. Due to the aforesaid market demands, Mondi decided to define and develop a series of machines that, in conjunction with Pasaban, would be specifically designed to meet its needs and the characteristics required of its finished product. By doing so, the desired solution would enhance the flexibility of the plant when responding to market demands. 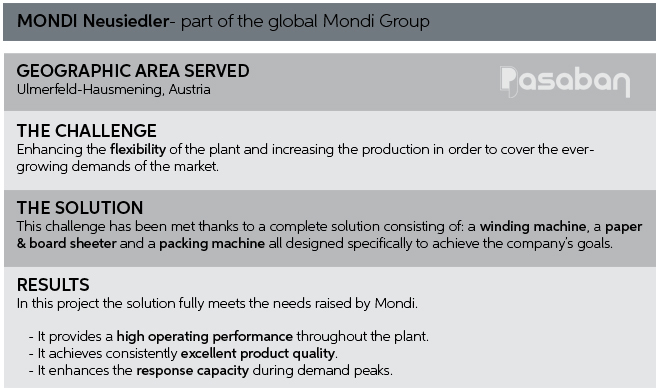 Pasaban’s total solution for Mondi’s Neusiedler plant consists of different machines delivered in various phases. Phase one was devoted to designing and manufacturing a paper winding machine. One of the factors that tipped the balance in favour of Pasaban’s solution was the option of full design customisation that enables the required automation to be installed. After the excellent outcome of the first project, Mondi considered that Pasaban, due to its flexibility and high quality, was the most capable company for carrying out some of the upcoming projects. The second project consisted of replacing the old paper sheeter. They needed a machine that provided flexibility, productivity and the highest quality of the finished product. The result was highly satisfactory. Thanks to the solution provided by Pasaban, the cut quality of the finished is completely clean. Finally, the finishing area of the Austrian plant will be completed with a double exist ream wrapper which will enable Mondi to obtain the number of reams required in the shortest possible time. These machines provide Mondi with a complete solution adapted to their needs and capable of meeting their objectives by providing precise, high-availability machinery, optimal for meeting the requirements of a sector as demanding as the food industry. The outcome of the project has been satisfactory in all phases. Our extensive experience when implementing fully customised projects adapted to each specific case enables us to provide the best solution to the challenges posed by our customers. At Pasaban we believe that the quality and flexibility of our machinery united with an impeccable customer service capable of solving any problems both on remote and on-site are our most important values when approaching a project. These are the values that enable us to carry out such strict requirements projects such as Mondi’s. Our solutions, for both complex projects and individual machines, provide our customers with the ideal product: highly customised machines will enable them to position themselves as quality benchmarks in their sector. If you would like to know more about some of our other projects and solutions, feel free to contact us.